San Martino Organic Farm and Guesthouse "La Quercia"
producers of fresh organic vegetables and Genovese Basil, family style. San Martino Organic Farm is the realization of a life-long dream for Alberto Dalpiaz and his family. After many years of work as an export manager for several major Italian food companies Alberto, with his wife Giulia Bartellone, established San Martino Organic Farm (Azienda Agricola San Martino) on the hills behind Porto Maurizio (Imperia), Liguria. Since it's establishment in 2004, Alberto, Giulia and their two sons have worked tirelessly to produce the highest quality food in the most ecological way possible. At just under 4 hectares in size San Martino Organic Farm contains three separate vegetable patches as well as a small fruit orchard, olive groves, and several bee hives. San Martino Organic Farm also produces it's own extra virgin olive oil from the Taggascia olive, a highly prized olive variety originating in Liguria. The latest addition to the farm is a newly renovated 3 bedroom, 3 bathroom guesthouse overlooking beautiful Imperia and the sea (see the 'Stay with us' tab for more information). 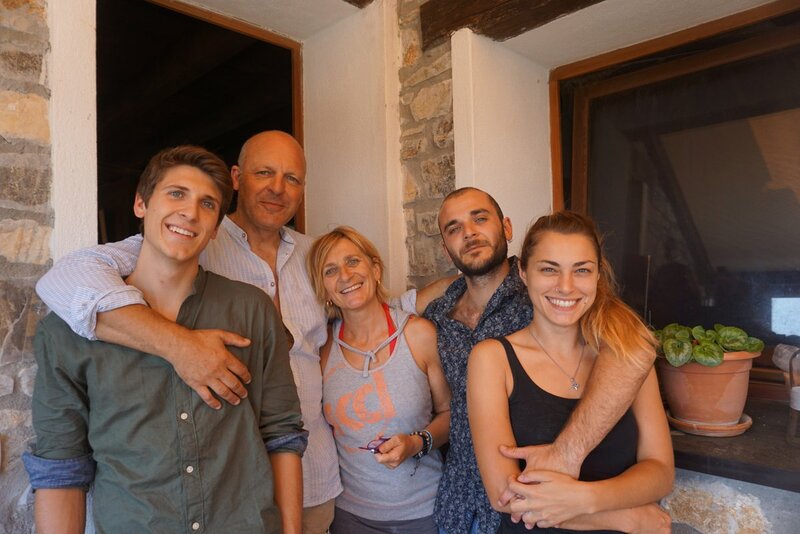 From the left: Pietro (youngest son), Alberto, Giulia, Andrea (eldest son), and Vanna (Andreas' fianceé). Not pictured: Mila (the dog) and Diego (the cat). At San Martino Organic Farm we are proud to produce and sell local varieties of fresh produce without the use of any form of pesticides or chemical fertilizers. For us there was no choice to make. Our farm is founded on a deep respect for the natural beauty and inherent value of the land in which it occupies. From the very beginning (even prior the existance of the organic certification) we at San Martino Organic Farms have embraced the idea of an ecological existance. We are a certified organic farm under Bio AgriCert Italia. Premio BIOL 3° Classificato (26th of May 2018) - Our olive oil has been internationally recognized and awarded a silver medal by BIOL. Best in Liguria region - 3rd place for our olive oil. Presidio Slow Food - Liguria region (in recognition of traditional preparation and cultivation of Taggascia olives).